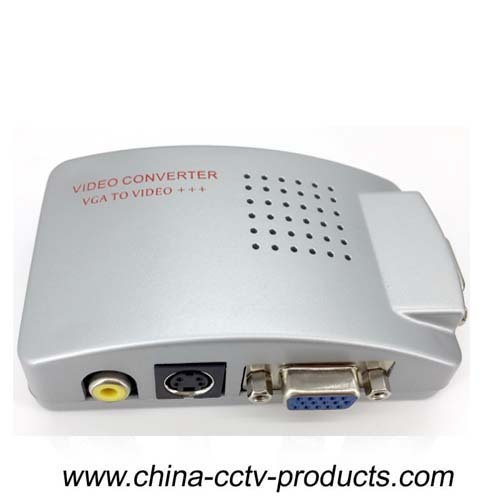 BNC Composite Video and S-Video to VGA converter allows your DVR or CDD camera to be displayed on standard computer monitor, converting a computer monitor or LCD into a CCTV monitor. The connection on the back of DVR and CDD camera is RCA female, which is to be connected to the RCA input of this converter. The output video quality is better than the direct VGA output from DVR. Video Converter can easily help you to realize the conversion of VGA signals into Video/S-video signals. 1. One input of VGA signals, one output of VGA signals. 2. One output of Video, one output of S-video. 3. One ACPI of 5V. 5. At the same time, output the VGA/VIDEO/S-VIDO signals. 6. Show Simultaneously pictures on the monitor and TV. 7. Support the systems below. 8. The TV systems of NTSC (Taiwan and USA), NTSC-EIAJ (Japan), PAL (EURO, china) PAL-M (Brazil),PAL-N (Uruguay Paraguay). 9. Support the OVERSCAN and UNDERSCAN display mode. 10. Convenient to carry because it is light, thin, short and small.